On Monday the 5th of October, Golden Goose PR shared a moment of advertising history with some remarkable women and Samsung. 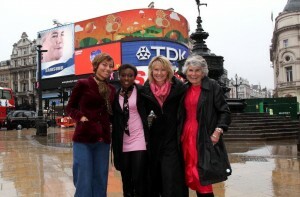 As part our Morethantalk.eu breast cancer awareness campaign, Samsung had arranged to donate its Piccadilly Circus big screen to show Everybody’s Doing It, a brilliant and moving viral featuring eight British women whose lives have been affected by breast cancer. Four of the ladies in the viral came to meet us under the statue of Eros. They included Amanda Jones, 67, who lost her 33 year old daughter Rebecca to breast cancer; Wendy Evans-Scott, 46, who has successfully recovered from the disease; Emily Holt, 29, who was diagnosed in 2008 and Maria Cesay, 32, who has breast cancer in her family. At 11am, shielding themselves with pink umbrellas from a curtain of torrential rain, Amanda, Wendy, Emily and Maria braved a 40 minute photocall. Our skilled photographer battled against the elements to capture a series of happy shots that we syndicated to the national press. As the pictures were taken, LBC and Capital Radio waited patiently under shelter to interview the four women. A later telephone interview was arranged with London’s Smooth FM. The PA gave us some great support spreading the word further and we got some lively news plugs on Magic Radio and Heart. With GMTV mentioning the news that Samsung’s breast cancer campaign was making history in Piccadilly Circus and a double page that morning in the Daily Mirror with Emily, Amanda and Lara, the day really couldn’t have gone better. But what really made it special was seeing the women in Samsung’s video broadcasting their message to London in 60 inch technicolour. So many people stopped, looked up and took in their message. It’s been a real privilege to be part of a campaign that has spread breast cancer awareness in such an effective and memorable way.